Common design complaints from mobile home owners are vinyl-coated walls, laminated cabinetry, and low side walls and ceilings. We’ll show you how a professional interior designer conquers these issues with tons of great mobile home decorating ideas for every room. 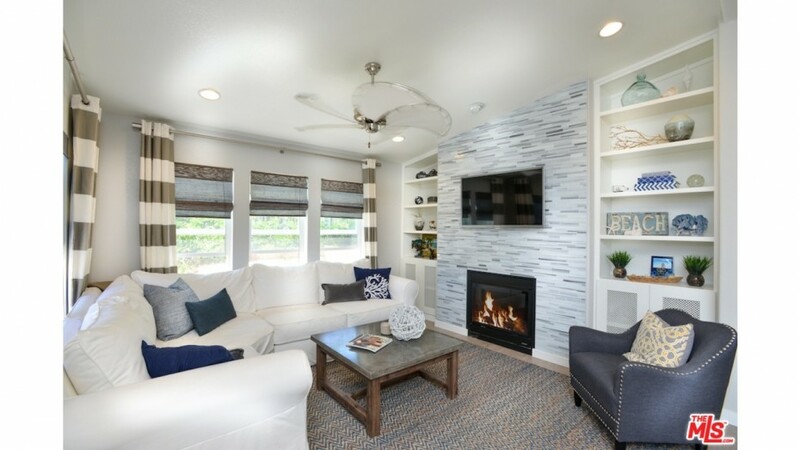 We’ll go through each room and share all the great mobile home decorating ideas for the most common mobile home design obstacles. 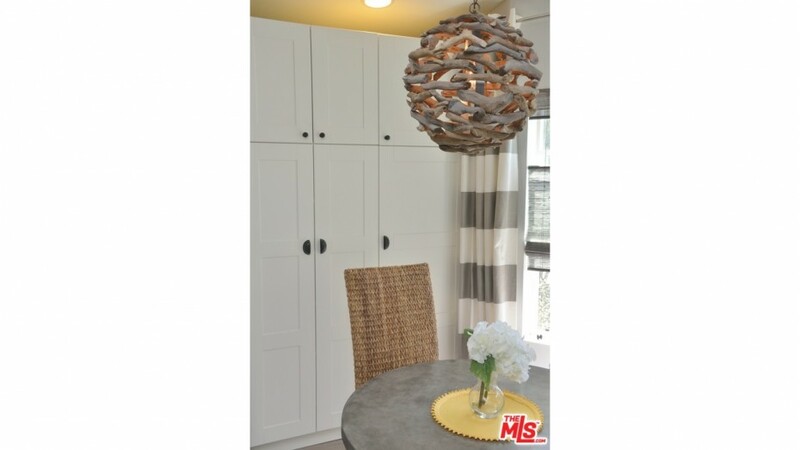 This double wide is decorated in a modern cottage style with a white neutral color scheme. The interior has a combination of monochromatic hues, bright white accents, and light colored natural textures to create a welcoming atmosphere. 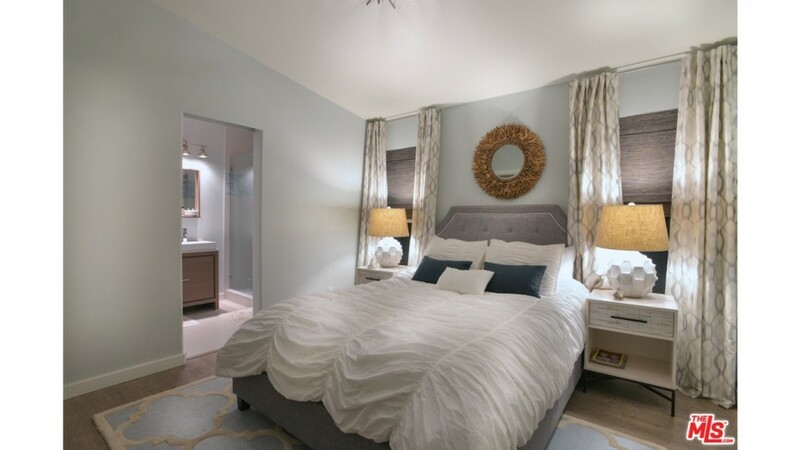 Using light colors makes a room feel bigger. Lighting is an important feature in any room but especially for mobile homes. The low 7′ sidewalls and smaller windows that most factory-built homes have are difficult design obstacles to overcome, especially if you are on a remodeling budget. Additional lighting makes any home feel more modern. Mixing different lighting styles, such as recessed and pendant, puts focus on the highest parts of the room and tricks the eye into thinking the room is taller. 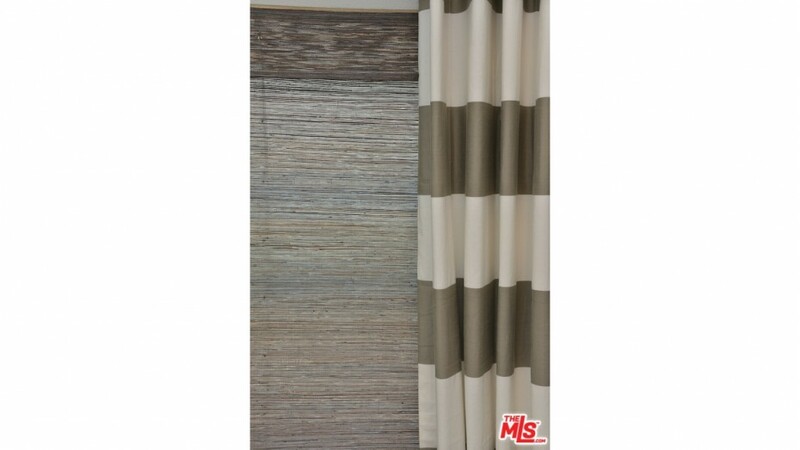 Installing curtains as high as possible on the wall also makes a room seem taller. This trick is a popular move by designers because it works so well and is easy and affordable. Flooring that is darker than the rest of the room helps ground the area and also makes a ceiling appear taller. The idea is to put as much focus on the highest and lowest areas of the space. 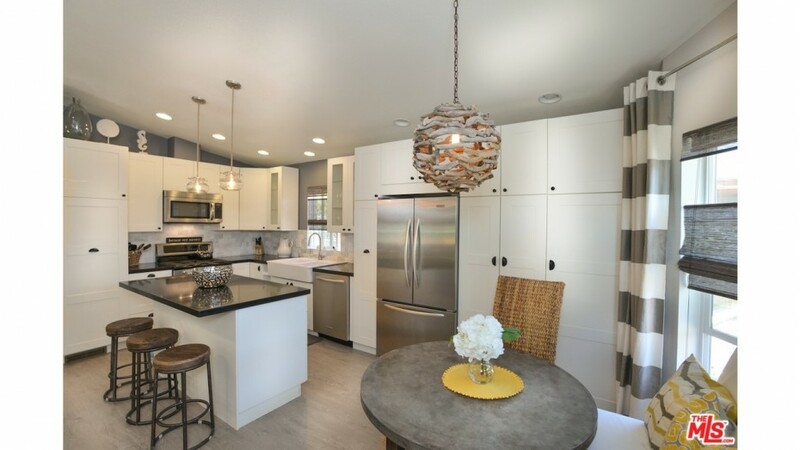 More great mobile home decorating ideas for kitchens include open shelving, subway tile, apron sinks, center islands, and pendant lighting and this kitchen has them all! The quickest way to update a kitchen is to upgrade the appliances. Appliances come in all shapes and styles so try to keep to one style or color. Stainless steel is the most popular appliance choice but it is not the easiest to keep clean and fingerprints can be a burden. Installing an island is a great idea for both small and large kitchens but you’ll want to ensure the island is the right size for your space. 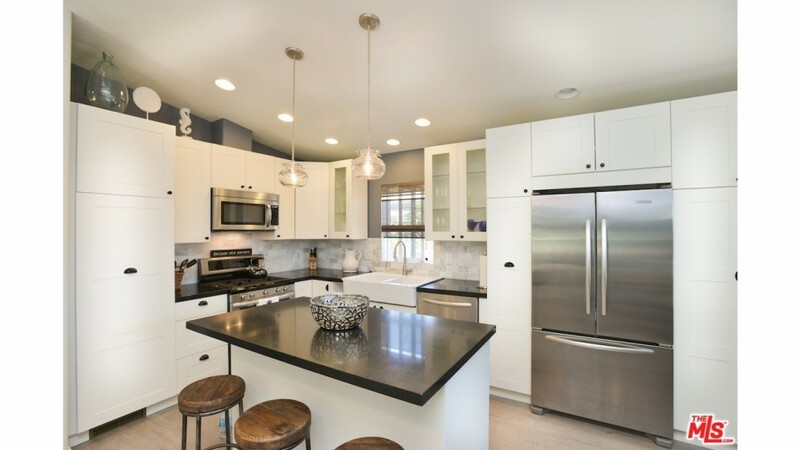 One expert suggests that you keep islands around 40″ square and 36″ tall, or as tall as the rest of your kitchen counters. 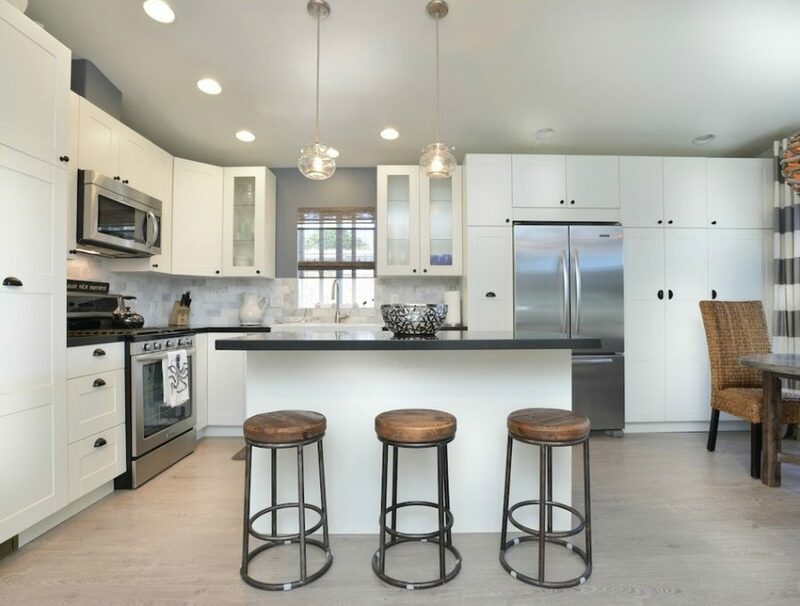 Learn more about designing kitchen islands here. Additional storage is important for smaller kitchens and floor to ceiling cabinetry is a perfect way to get it. Manufactured homes usually have cabinetry that is placed 12-18 inches below the ceiling and that leaves a lot of wasted space. Installing cabinets up to the ceiling adds storage and pulls the eye up. We previously covered 7 Affordable Ideas to Update Mobile Home Kitchen Cabinets. Adding open shelving or glass doors to your kitchen cabinets is another big trend in kitchen design. You can use standard cabinets with glass doors or just shelving in places that would otherwise be wasted. This trend is great for small kitchens because it makes a room appear larger while giving you extra storage space. 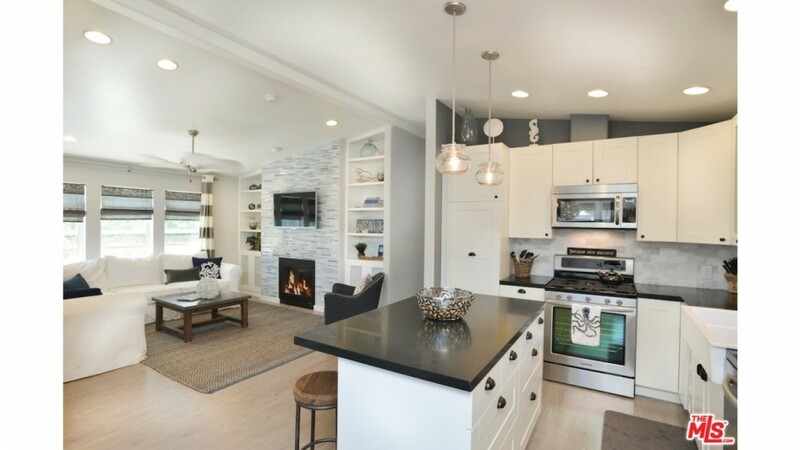 When you hear the words ‘open floor plan’ it usually means the dining room, kitchen, and living room are one space. 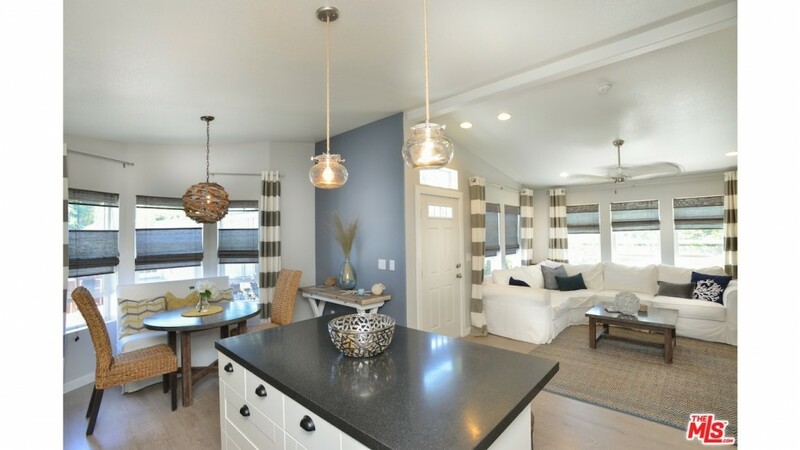 Open floor plans are used often in popular modern manufactured home models. Open floor plans are both an asset and a dilemma for interior designers. 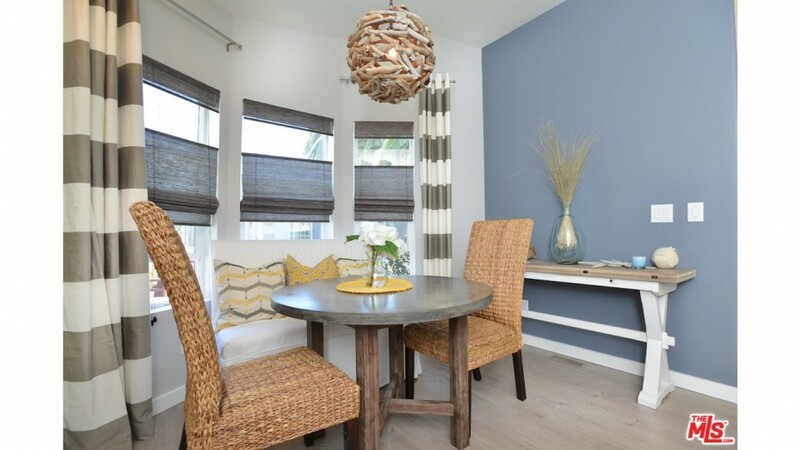 By keeping the same color scheme and decor you can maintain cohesion. You still want to still create separate work zones with grouped furniture like the designer did in this home. Removing walls in mobile homes is difficult and messy but can be done. We always advise against modifying marriage lines but interior walls aren’t as difficult. The darker gray accent wall in this dining room perfectly incorporates the color from the shades in the rest of the home. Using Accent Walls in Your Mobile Home is a great way of adding a little color and drama to a space without spending a fortune. The designer uses a large ceiling light made of driftwood to pull the eye up. To create cohesion and flow, wooden shades and dining room chairs made of wicker were added. Texture is a perfect way to add interest and detail to a room and you don’t need a lot of it to make a big impact. This is definitely a bedroom that makes a statement without saying a word! The best advice for decorating bedrooms is to keep it as simple as possible. Leave the technology behind and make the bedroom your space to relax and unwind. The designer keeps the ceiling white but adds a light blue to the walls. 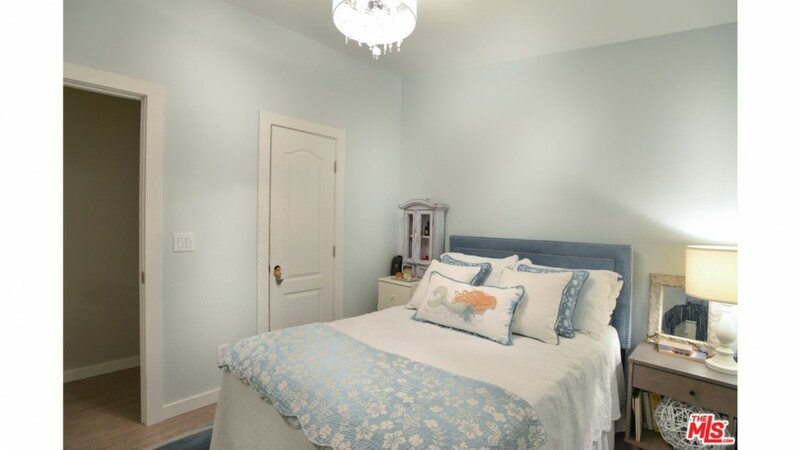 Blue is considered the best color for bedrooms because it relaxes and calms. Light green is another good color choice. 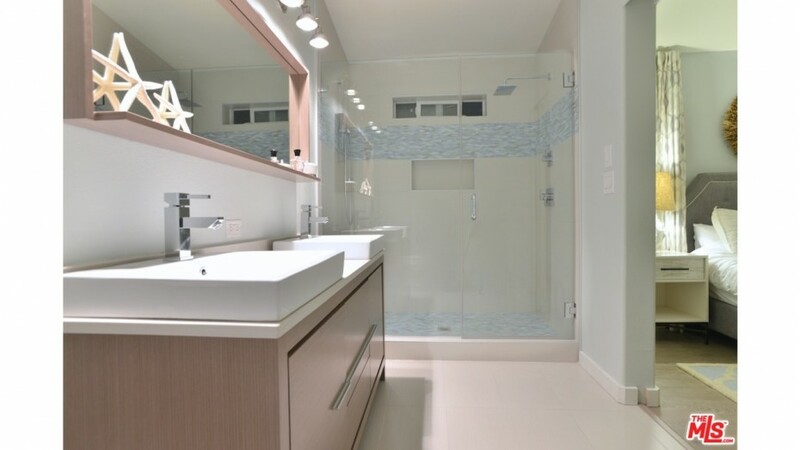 Sleek and subdued color best describes this beautiful bathroom and is another great mobile home decorating idea. This master bedroom and bathroom suite is gorgeous and inviting. The subdued hues found in the living room, kitchen, and dining room can be found in the bedroom and bathroom, as well. To simplify your home decor try to stay within a small circle of colors and textures so you can move things around between rooms to change things up a bit. 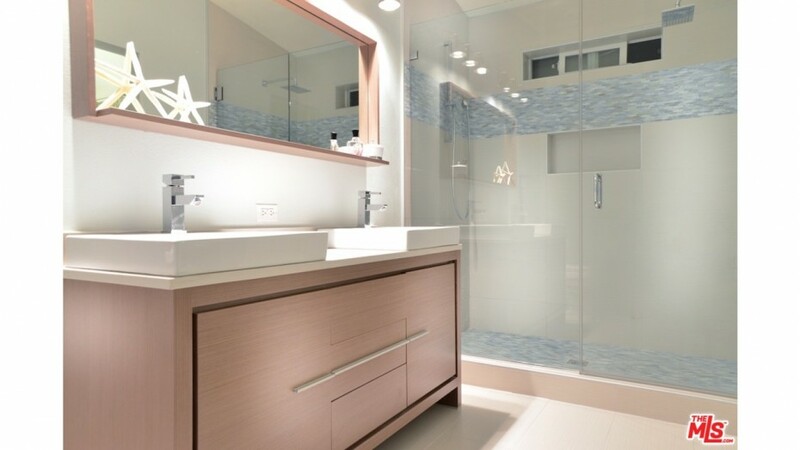 The same color combinations are used throughout the home, including the bathroom. This trend is great for smaller homes and those remodeling their homes on a budget. Buying paint, tile, and fabric in bulk is a very cost-effective way to save money. A more subdued color palette seems to be the preferred choice for interior designers these days with natural texture used to add the unique touches that every space needs. This is a beautiful home with lots of great mobile home decorating ideas for every room. I love everything about it! 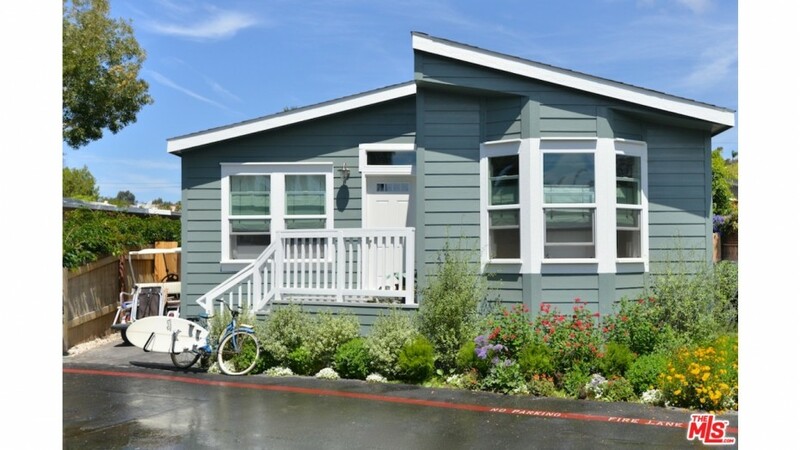 Today’s featured home is a double wide located in the famous Paradise Cove Mobile Home Park in Malibu. It listed on the market for $1.1 million in 2014. The listing agent, Michael Gardner, of Malibu Real Estate Blog, was kind enough to share this home with us. Thank you, Michael! I live in a newer mobile home 2004 and I have a problem with being worried about the weight of the products used for floors, counter tops etc. I don’t plan on moving it but when you live in a mobile home park anything can happen. They could sell the park or raise park rates to high etc. then you either have to sell or move the mobile home. I have replaced laminate countertops to solid surface and back splash with glass tile. I wish they made better cabinets for mobile homes and wood cabinets are very heavy. I hate laminate..
You are smart to worry about this as it is an issue for mobile home transport (and you’re right, you just don’t know what can happen in the future). You are talking about load rating and I’ve read that a home with 16″ OC floor joists can carry 53 pounds per linear foot. Other than that, this is a subject that’s way over my head (I can’t math very well..lol). I did find this HUD white paper about the various loads that may help. Sorry, I can’t help. Best of luck! HI, this is a great article. Lots of tips for redesigning. I just moved in with my fiancee.”s bachelor pad…..love it. But it does require updating in a very fixed budget. It’s an 1970’s single wide with the low popcorn ceilings. But it has been drywalled! Ya! But….it’s so so dark inside. How do I change it up with a modern light color without making it feminine or look like I invaded his space? And not using grey (grey is a depressing color for him). Looking for color suggestions and all recommendations are appreciated. P.’s. We both are harley davidson lovers…so want to incorporate orange. Right now it’s navy blue and red. I would go with a light cream or white and let all the light possible bounce around! You could give the room color with decor. Have you seen the Harley Davidson patents on parchment paper? I think they would look great framed and lining a wall. Please take pics of your before and after – I’d love to see/share it! Yes, thank you for a site dedicated to mobiles. There are tons of websites for home remodeling, and ideas, but we do have a specific type home, now, don’t we? And there are special issues when it comes time to do anything to change the structure or improve it (or even fix it!). Thank you to you, and to all who post their ideas! Love your site We have a freshly painted popcorn ceiling in the double wide we rent. Sometimes when I watch HGTV, I ask myself “Am I the only one on the planet who doesn’t hate popcorn celings?”. Its always the first thing Chip and JoAnna point out & say it has to go. ? We have popcorn ceilings and I don’t mind them either. I see them as easy to repair (especially in manufactured homes). They’ll be back in style in a few years without a doubt! Mobile Home insurance is a very specialized type of home policy that protects your property. Since mobile homes depreciate over time, it is very important that they are covered with the proper endorsements to replace your home in the event of a total loss. Great article, love the pics and ideas, thank you for posting! We’ve had a crazy couple of weeks with server issues (stuff that’s way over my head). I think they’ve figured it all out. Sorry about the trouble! I love this website as I have been working on a fixer upper on a single wide I’m working on a shoestring budget it has helped with article what you should or shouldn’t do. Also the renovations have given me ideas. Glad you like us, Thelma! Thanks Caleb! With my grammar skills (or lack of), I guarantee you’ll find many, many more mistakes! Sorry! Finally! A website for mobile home owners! I live in a remodeled mobile home, done on a tight budget. I bought it as an insurance casuality due to an electrical fire. Totally brought it back and it’s been home since 2001. I have no plans of moving or buying a new home. I’m so glad you like MHL! I created it cause I couldn’t find anything online to help me plan my own remodel. I’m so glad it’s helpful to others! I bet your home is gorgeous! (I’m always looking for homes to feature and hope you’ll consider it someday). Thanks so much for taking the time to comment – you made my day! 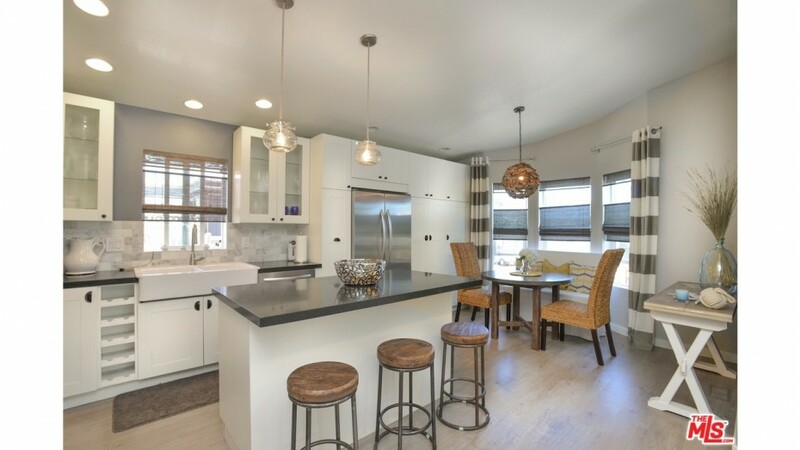 What countertop material did you use in this mobile home? Thanks for featuring this home. I had saw it in the listings, but couldn’t find it again. I’m in love with the shades. Thank you for reading MMHL Sandi! I appreciate you and your kindness very much!